The official opening of the $195 million redevelopment of Qenos in Melbourne’s west is said to secure hundreds of jobs and reinforce Victoria’s reputation as a leading manufacturing state, Premier Denis Napthine said yesterday. Victorian Unions support Qenos Memorandum of Understanding. October 2012. Qenos, an Australian manufacturer and supplier of plastics, celebrated the event in Altona yesterday, joined by Executive Chairman of Qenos, Mr Ross McCann; Qenos CEO Mr Jonathan Clancy; Dr Napthine, and the President of ChemChina, Mr Ren Jianxin. “It is the largest manufacturer of plastics and petrochemicals in Australia and this $195 million redevelopment will boost production by a further 20 per cent. This upgrade involves converting ethane gas, from Longford, into steam to drive turbines and generate power for Qenos’ operations,” Dr Napthine added. The upgrade is said to also include a number of plant upgrades that will support research and development programs to develop new high value-added products. “The Victorian Coalition Government is pleased to support Qenos in ensuring the long-term future of this key asset and securing manufacturing jobs in Melbourne’s west,” Dr Napthine said. 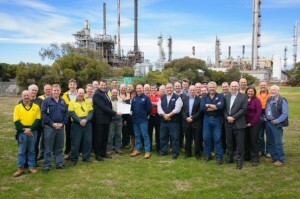 Towards the end of last year, State Secretaries of the AWU, AMWU, ETU (CEPU) and the NUW, jointly agreed to the objective of maintaining a viable business with the highest number of affordable, highly trained well paid jobs; working together to build shareholder confidence by delivering successful shutdowns and projects; honouring agreements and making all efforts to resolve matters in a manner that will minimise industrial disputes. (Qenos). Qenos and the Unions have worked cooperatively together since signing a Memorandum of Understanding back in 2003.